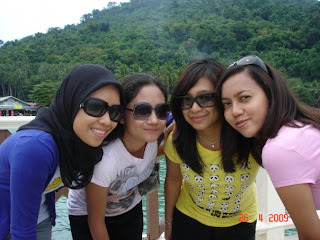 Today, May 8, 2009, another friend of mine is engaged. I put on 3-healthy-kilos and I'm gonna stop right there. For the whole week I have not been able to meet them. Been hold on dragged discussion, lunch time pun dead and gone. If the bf were here (as in KL) he can always drive me to Pavilion for Carls Jr. But he's away so far away off the shore for so very long time now. Fifa said she hold some of the burden (as in missing him on behalf of me), thanks babe. But I don't want to dwell in my melancholic feelings anymore. I miss him, I miss them. But hey, its long weekend, AGAIN!